Today it was hot. The UK has limited days that are actually scorching but very occasionally they turn up unexpectedly in April. Today was one of those unexpected days. Luckily we had a day off and we had made plans, even booking slightly cheaper advance tickets. 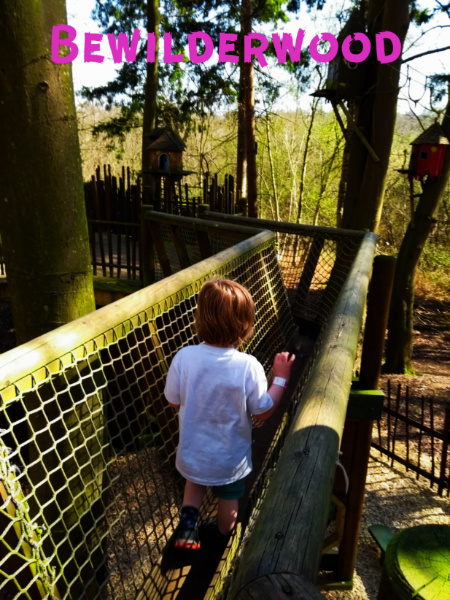 We headed to Norfolk to climb trees at Bewilderwood and I have to say it was really good. It’s quite a hard place to describe and I wasn’t sure what to expect. It’s basically a series of massive adventure playgrounds but they link it together with a story. They then throw in a free boat ride, crafts, face painting and puppet show. I would recommend a visit if you are in the area, we were very impressed. Ted (age 3) enjoyed all of the above! Ted did not enjoy meeting the puppet up close and leaving. Miss May (age 11 months) was little more difficult to please. Unfortunately the toddler area was closed for major rebuilding work by the looks of it so she was a bit limited. She enjoyed crawling around in the wood chip, the small children’s zip wire, the boat and my strawberry ice-cream. May did not like waiting around for Teddy, being in the pushchair, walking on the obstacle courses (she kept trying to jump off) and being in the car. Bewilderwood is near Wroxham in Norfolk. Wroxham is a small town that is completely overrun by tourism because it is the nearest place for most of the country to access the Norfolk broads. If you would like to take a boat out on the Broads (and you should, it’s a fun thing to do) I would look elsewhere for your boat hire! For us it takes just over an hour to get to Wroxham in a sweaty, non-air-conditioned car. The zip wire was a big favourite with Ted and he was able to have a long go on the small children’s one without getting in anyone’s way, even though there were only two. We were even able to have May on the other one for a while AND take it in turns to go over to the bigger kids line and have a go ourselves. We wouldn’t have managed any of that if we had needed to queue. Seriously, if you have under 5s try to make to most of the time before they have to go to school and get out there and do stuff on weekdays in term time. You’ll regret it when they’re bigger and you have to pay more for them to stand in long queues with everybody else’s children. We’ve been discussing how we can make our budget for days out go further by cutting back a bit on the extras (buying fewer souvenirs, packing a lunch etc.). So far we haven’t done well. I read a review somewhere saying the food at Bewilderwood was actually good and fairly healthy. I fell into the trap and we decided to only pack drinks and snacks. While I can’t disagree with the review I would say it wasn’t anything special either. The children’s options were basic so we ended up just getting a ham roll for Ted and nothing for May. We basically just throw whatever food is lying around at her and see what happens. For lunch today she had a bit of roll, a couple of my crisps, a bag of Organix carrot sticks and some of my ice cream which I fed to her using the blunt end of a wooden knife). The adult options were also limited. Having said that everything could be vegetarian if you wanted, so I probably had a wider choice than normal! The ice cream was proper ice cream and the lollies were real fruit. For me that’s a win. 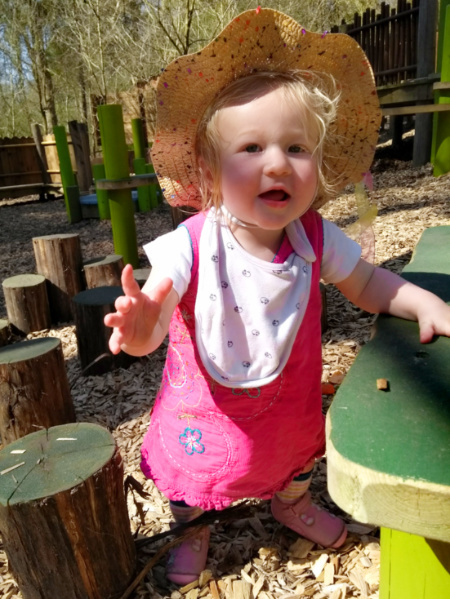 How much does Bewilderwood Cost? Bewilderwood is not a cheap day. May was free, Ted was in the lower cost band as he’s still just about under the 105cm height limit. David and I was obviously in the higher price band. We booked online in advance and the tickets for the three of us were still the best part of £45 in total. We also bought some lunch, ice-creams and small souvenirs so I would guess we spent about £70 today. Last week’s excursion to a free museum followed by a street food lunch cost £10-£15 so today was an expensive one for us. Despite being in the lower-priced category Ted wasn’t particularly limited. I don’t think he could have gone on the bigger zip-wire but other than that I didn’t see any other restrictions. Smaller children might have struggled on some of the ladder and rope climbs but like most three year olds Ted is an experienced soft player so climbing is second nature already. I think I would have been annoyed at David and I paying so much on a busier day. As it was a quiet day one of us was able to be with Ted at all times (having almost as much fun!) while the other entertained the baby. If we had just been standing around while he charged up and down then the price tag for adults is too high. Visit Bewilderwood’s website for more details and to book advance tickets. Do you have any recommendations for places like this near you? We would love to hear them.